Moroccan eggplant salad smothered in chermoula is a stunningly lip smacking salad. The eggplant is creamy, fork tender and packed with flavorful herbs and spices. It is low in calories, low carb and yet is a pretty good source of phytochemicals and other nutrients. 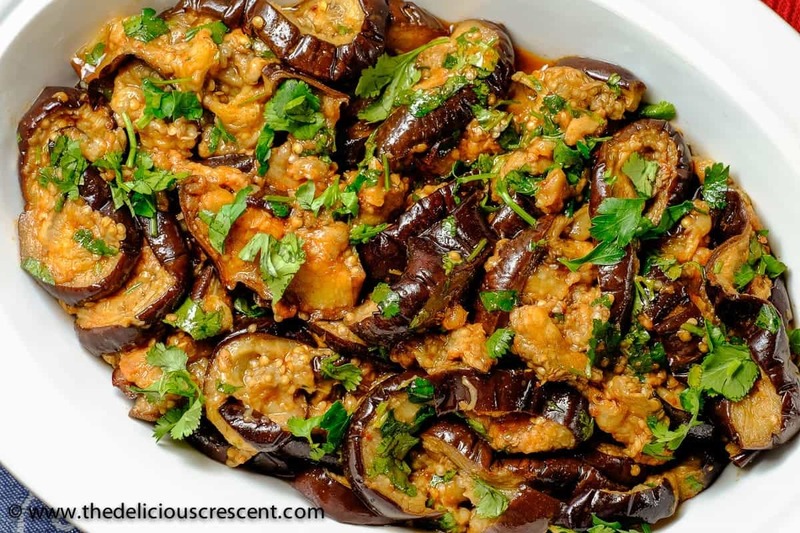 When I had visited Morocco, I had this delicious eggplant salad – my favorite eggplant tastefully steeped in this sauce/marinade called Chermoula. It was often served as part of a medley of cooked vegetable salads prior to the main entrees. I loved those vegetable salads so much that I wanted to order them all the time. Then I decided that I am going to go home, prepare and eat these salads. So much for my love of vegetables, that I needed this experience to boost it further. Typically, for this recipe, eggplant slices are lightly shallow fried prior to adding the chermoula. But then eggplants can absorb a lot of oil in this process. Many recipes suggest salting the eggplant slices as a way to prevent the oil absorption or remove the bitter juices. And some recipes will stick to the traditional way of shallow frying. I have cooked eggplants for years and have never bothered to do that, but always had good results. I simply start with choosing fresh and firm eggplants. Slice them and lightly brush with olive oil and bake them until fork tender and creamy in center. It is important to make sure that the slices are coated with oil evenly. You may also grill or broil the eggplant, as I further explain in the notes section below. Eggplant is a very low calorie vegetable. Due to its low carbohydrate and high fiber content, eggplant based diets have been recommended for management of type 2 diabetes by NIH, Mayo clinic and American Diabetic Association. One study showed that the phenolic antioxidant activity of eggplants had the potential to reduce the pathogenesis induced by hyperglycemia via its effect on cellular oxidative stress. Eggplants are a good source of potassium, vitamin B-6, fiber and phytochemicals. Have you heard of the slogan “Eat your colors” – That’s right, eat colorful vegetables and fruits! The eggplant’s beautiful purple color comes from the anthocyanins. Studies have shown that anthocyanins, chlorogenic acid and other phytochemicals in eggplants have potent antioxidant and anti-inflammatory activity. And a lot of the good nutrition is in that lovely skin. So don’t peel it away. 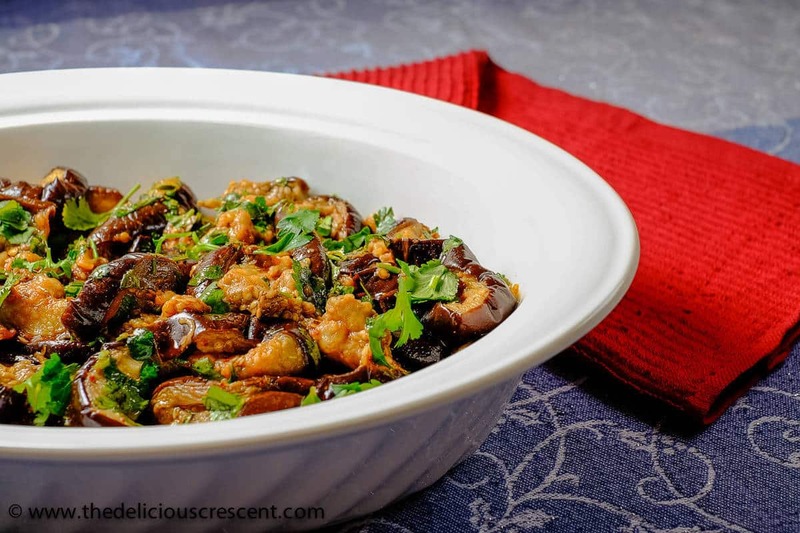 Moroccan eggplant salad smothered in chermoula is a stunningly lip smacking salad. It is low in calories and yet is a pretty good source of phytochemicals and other nutrients. Wash the eggplant and wipe it dry. Cut it into 3/4 inch slices. Brush the eggplant slices lightly but evenly with about 1 ½ to 2 tablespoons olive oil. Place the slices on a baking sheet lined with parchment paper or oiled aluminum foil. Bake until fork tender for about 25 minutes (time may vary with oven). Check at 20 minutes and adjust time accordingly. Set aside the baked eggplant slices and let cool to room temperature. Prepare the chermoula dressing by combining the remaining ingredients and whisk it well. Drizzle it all over the eggplant slices. Combine gently and set aside for at least half an hour. Plate the Moroccan eggplant salad with chermoula on a serving dish. Garnish with finely chopped herbs and/or preserved lemon peel. The eggplant can easily pick up the tanginess with just a little of the lemon juice. Start with smaller amount and adjust the lemon juice to your taste. The amount of spices and herbs in the baked eggplant salad with chermoula is just a guideline. It may be adjusted as per taste. Eggplant slices may be grilled, fried on a hot non stick pan or broiled about five minutes each side. Make sure to lightly brush oil on each side. And once done, flip it and brush the oil lightly on the other side and cook until done. Checkout the cooking tips in the blog post above for more information. I have never heard of chermoula before and am loving the sound of it! Chermoula is so delicious. Great fro dressings, marinades etc. This looks so delicious! 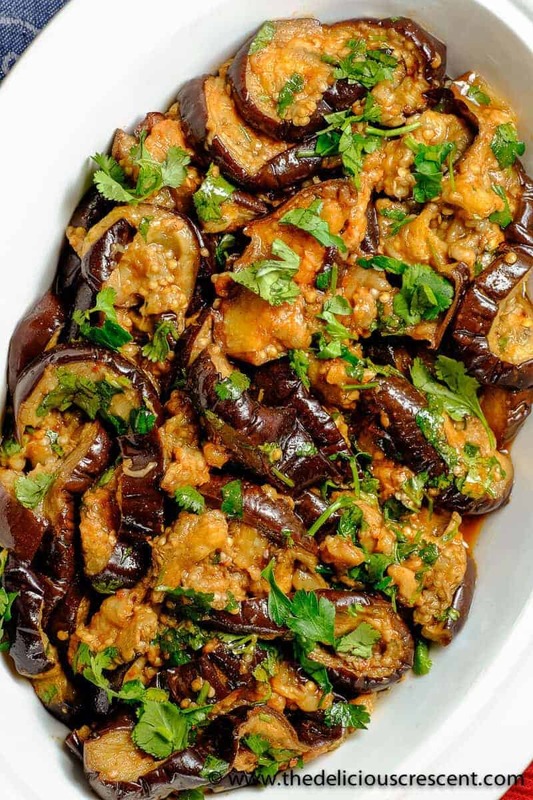 I love moroccan flavors and eggplant is so yummy! I like that you talk about the health benefits too! Thanks Dennis. I enjoy sharing my passion with the purpose of explaining the nutrition benefits from the food. This looks so favorable and delicious. I love eggplant in any way, shape or form! Thanks Patty. Me too :) I love it. 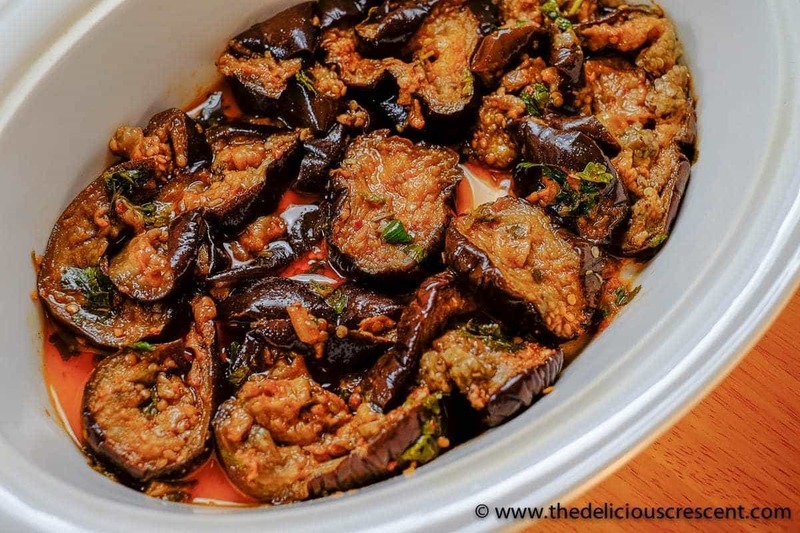 I love eggplant– and all of those spices! Yummy. Thanks Erin. It is fascinating. I enjoyed this Moroccan eggplant salad all the time while I was there.